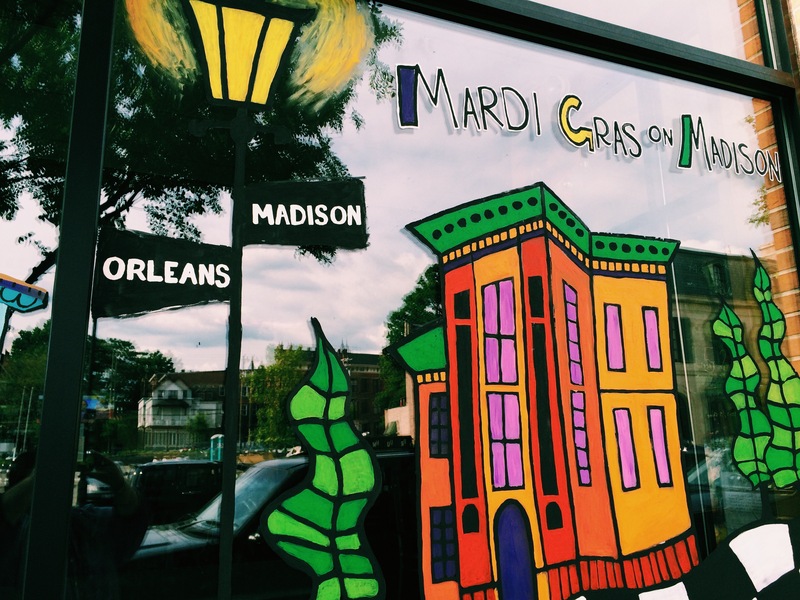 Mardi Gras on Madison – Go There. Try That. We just tried Mardi Gras on Madison. Not only am I a fan of Cajun food, but I’ve been hoping for this area of East Walnut Hills to further develop. So this restaurant, along with the Growler House and O Pie O are welcomed new businesses (both located close to Suzie Wong’s) on DeSales corner . When you enter the restaurant, you want to walk up to the menu board to see what’s being served that day. As the waiter described it, Mardi Gras on Madison is a homearaunt- meaning the menu changes frequently and the hours change, too. The first time we tried to eat there, it was closed. While I always appreciate a local, family business, their hours can be tricky. Best thing to do, follow them on facebook. The theme of Mardi Gras on Madison is New Orleans style cajun food. 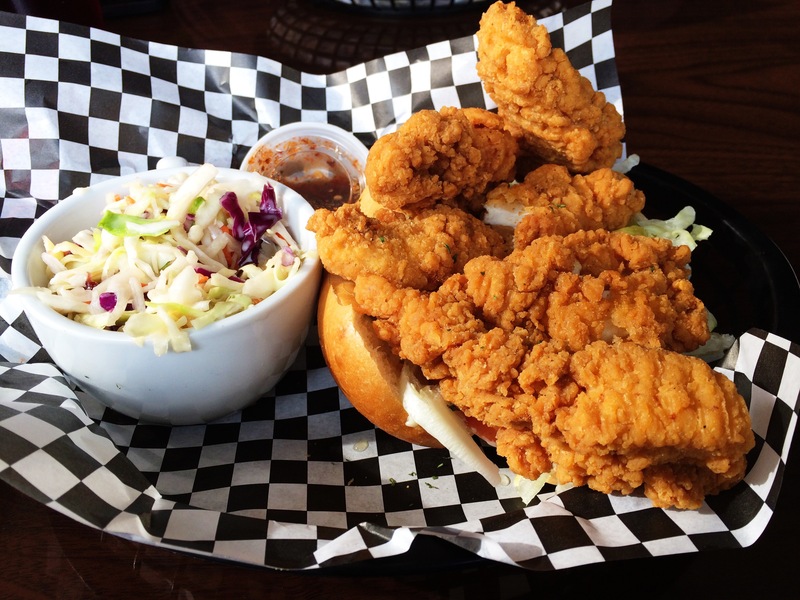 Po’ boy sandwiches are the feature. Some of the revolving items include cheesy grits, kale, gumbo, sweet potato casserole, okra, caramel sweet potato pie, fries, and slaw. The gumbo was not on the menu when I was there, but I cannot wait to go back and try it! 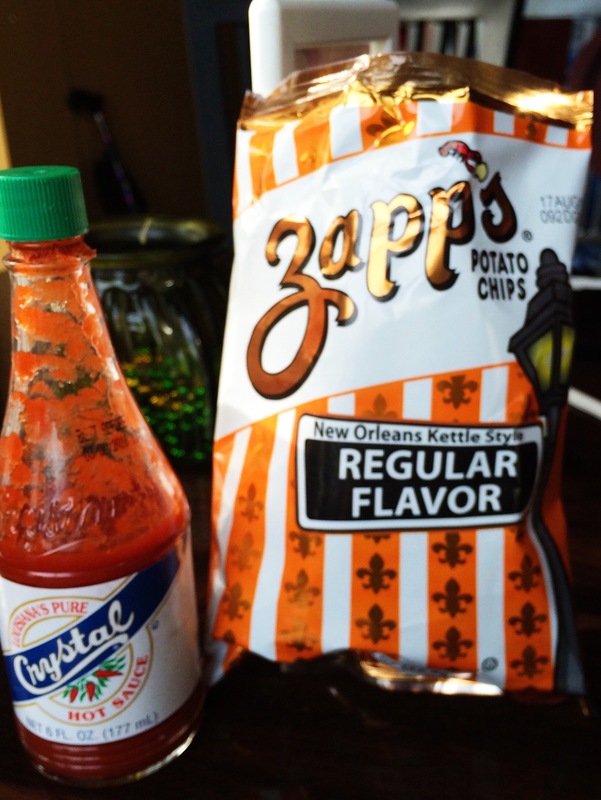 Zapp’s kettle chips, straight from New Orleans, are a staple. 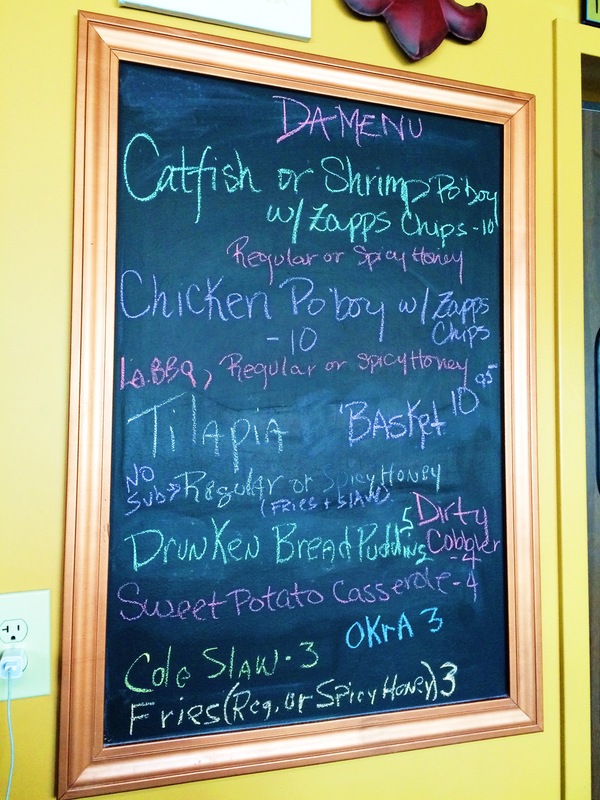 The Po’ boys offered are catfish, chicken, and shrimp. We got one shrimp and one chicken. These huge sandwiches served on a baguette simply must be man-handled. Expect to get messy! I had to take three pieces of chicken off my sandwich just so I could close it up and eat it. 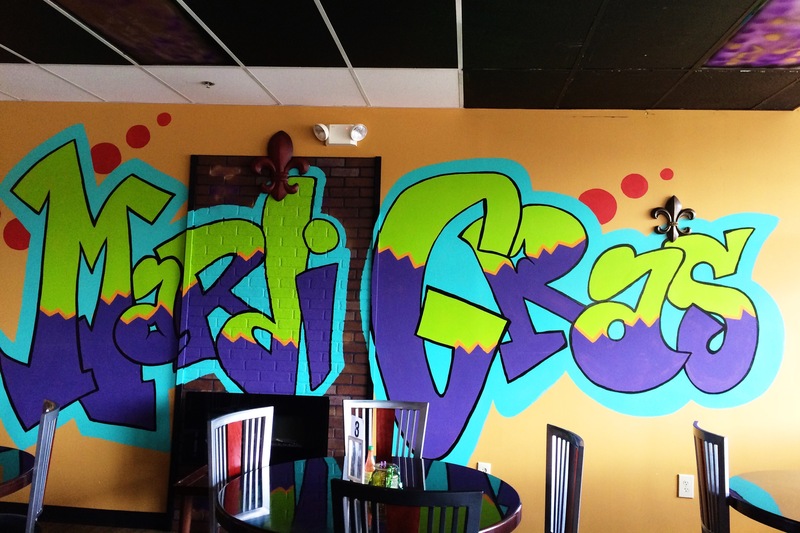 Disclaimer: If this is your first date, and you get self-conscious, don’t eat here! These Po’ boys come with lettuce, tomato, mayo, pickle, and a homemade spicy honey. I’m not a fan of honey so I was going to skip this, but the waiter convinced me to at least order it on the side. Let me be the first to admit, I was wrong…very, very wrong! Remember those pieces of chicken I pulled off. That spicy honey ended up on my sandwich and as dipping sauce! Furthermore, the lettuce, tomato, pickle, and mayo are a great balance for the fried food. By the way, if you don’t like fried food, this isn’t the place for you. My tip, order extra napkins and extra pickles! Overall, really good and very filling! 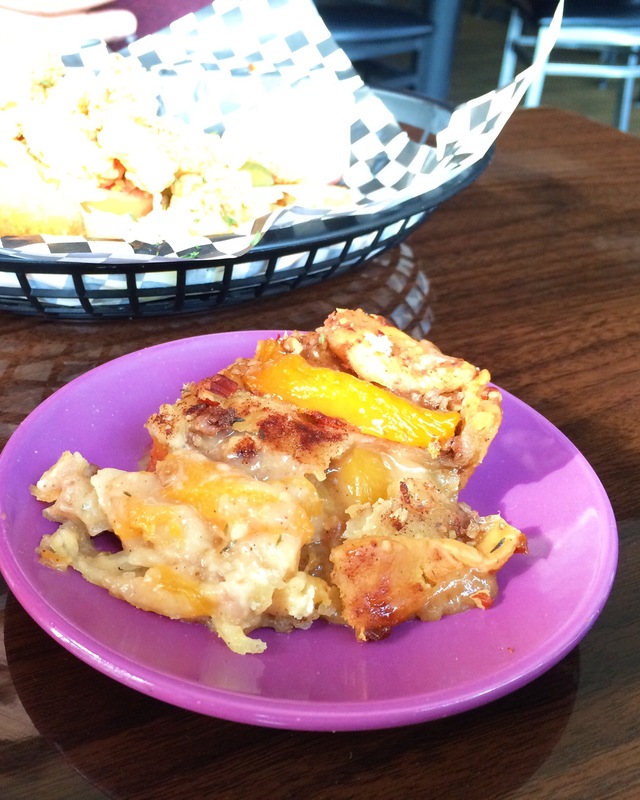 Let’s talk about this dirty peach cobbler. The waiter was selling this one because he had a strong hand in creating it and it was really good. It had less granulated sugar and more sweetened condensed milk. Because it used sweetened condensed milk it had a thicker consistency and tasted more like a warm piece of yummy peach pie…and I’m not even a pie eater and I like it. In the end, we spent just under thirty dollars (including a nice tip for great service) for two drinks (sweet tea of course), two huge sandwiches, two bags of chips, a side of slaw, and a dirty peach cobbler. We couldn’t even eat all that! Not a bad deal if you ask me. GO THERE (Mardi Gras on Madison)! 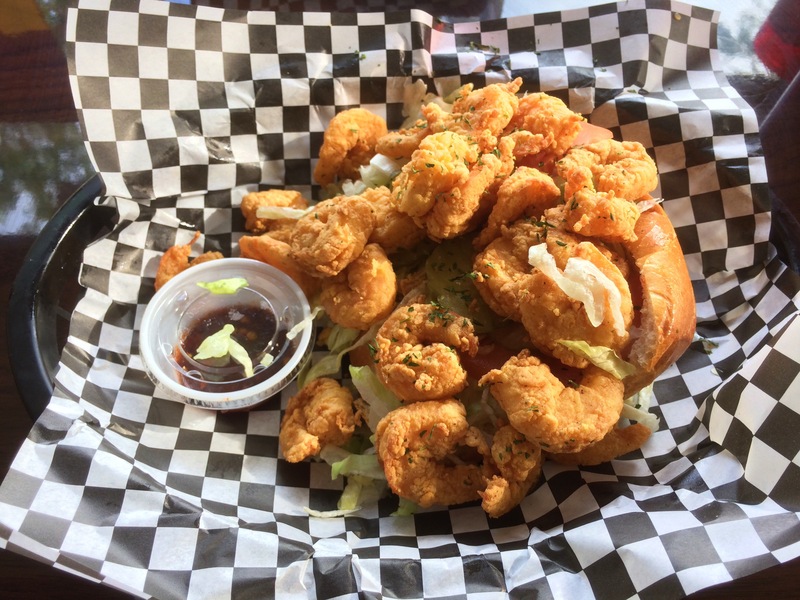 TRY THAT (Po’ Boy)! I got the shrimp po boy and sweet potato casserole when I went…all delicious! And yes, that spicy honey…whoa and whoa. So good! Can’t wait to go back!